I seemed to have made better decisions when book picking last time and The Bookseller of Kabul proves it. Truth to be told, I'm probably late by a few years with reading it - I'm dimly aware that it was a hot title during the top of Afghanistan frenzy. Nevermind, I still enjoyed it. Books like this one inevitably make you think. 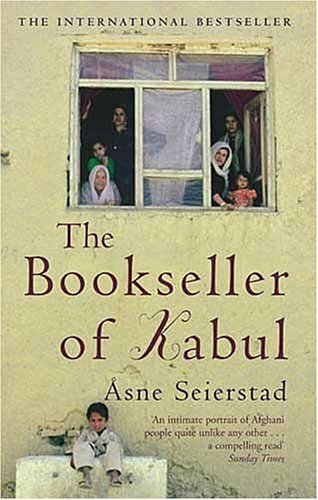 I won't even start on the issue of the last Afghan war, whether it was justified or not, whether it brought more damage or benefit to the country and The Bookseller of Kabul doesn't either, not really, although it does portray wartime reality of Afghan citizens. Seierstad's novel/report (call it what you like) focuses mainly on patriarchy in Afghan society, criticising it without actually pointing the finger. I find it an interesting literary trick - the bookseller in question is introduced as a gracious host who allowed the author into his own house etc. Nevertheless, to the western eyes the man appears rather ghastly. Nowhere in the book can you find any direct criticism, all you get is are descriptions of some day-to-day events, ranging from mundane to tragic. Still, the portrait is scary (and it didn't appeal to the man either - after the book was published, he sued the author for defamation). If you ask me, it's not the man, but the whole society that is frightening. If the book is to be believed, women are no better than men when it comes to judging and punishing whoever happens to be of lower social status. It's the jungle law in the purest form - whoever happens to be the most powerful, issues orders and woe be to you if you dare to disobey. Victimisation of those without power is the obvious consequence, and there aren't many shelters available if you decide to rebel. Or so it seems, because judging a society on the basis of one book seems a bit irresponsible.